Hsuan-Yu Pan, Elmhurst, NY. Documentary Short, 8:21, New York Premiere! 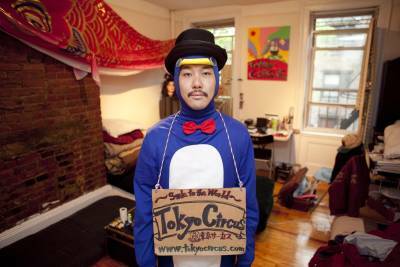 A mysterious Japanese street performer in a monkey costume (or other extravagant garb) , calling himself Tokyo Circus Ringmaster Yoshi, wants to bring smiles to the world with his goofy dance and intriguing messages on the cardboard. Can he make it? Ben Dorger, Washington, DC, Documentary Short, 12:07, World Premiere! The Down Home Daredevils is a short documentary that tells the story of a circus sideshow couple (Tyler Fyre, Thrill Kill Jill) and their two baby boys. The couple is faced with the new challenge of juggling their carrier as fire breathers and sword swallowers and their roll as parents. The charming short follows the Lucky Daredevil Thrillshow from the families home in rural West Virginia to the Hell City Tattoo Convention in Columbus Ohio. The documentary, REHEARSAL, follows the Dean of the Coney Island Sideshow as he struggles to complete his new act, The One Minute Magic Act, before the season opens. 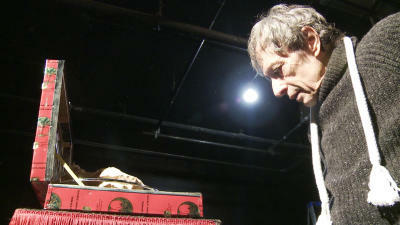 The fascinating Scott Baker is the longest-standing performer in the Coney Island Sideshow. In this observational documentary, we see a portrait of a journeyman vaudevillian - his charm, his stamina, as he struggles and veers into mania - almost overwhelmed by the artistic and personal demands of a man who's spent his life in the theater. 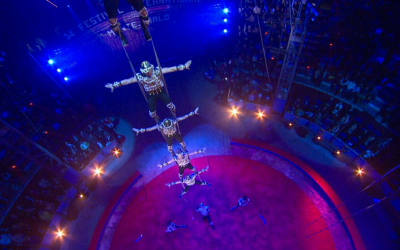 Following five of the top circus acts from around the world to the 'Academy Awards' of circus competitions, the Monte Carlo Circus Festival, the film reveals the behind the scenes life, history, and culture of circus on an international scale as never done before.